There is probably no one disease that so fully encompasses the intersection between geriatrics and palliative care as does advanced dementia. There is a high prevalence of distressing symptoms such as pain and dyspnea, which only become more common as the disease progresses. There is significant functional decline, caregiver distress, and great need for advanced care planning. There is also a very high likelihood that individuals with very advanced disease will undergo burdensome interventions that offer little evidence of benefit. A great example of one intervention that offers little in the way of benefit and yet is commonly performed in advanced dementia is the feeding tube. Despite a complete lack of evidence to show any benefit in regards to preventing aspiration pneumonias and pressure ulcers, improving comfort, or prolonging life, feeding tubes are still placed. One reason I often hear why feeding tube prevalence is high in individuals with advanced dementia is that many family members have unreasonable expectations about the benefits. Research by Joan Teno and colleagues should give us great pause in blaming family members for making such a decision. Dr. Teno’s study “Decision-Making and Outcomes of Feeding Tube Insertion: A Five-State Study” was published in JAGS in May and was discussed in an excellent NY Times New Old Age piece by Paula Span. The authors interviewed 486 next-of-kin of decedents whose death certificates recorded dementia as the primary cause of death. These individuals came from 5 different states - 2 states with low rates of feeding tube use (MN and MA) and 3 with a high prevalence for feeding tube (AL, FL, TX). To be included in the survey, these family members had to report that either a feeding tube was inserted, a decision was made not to insert a feeding tube, or that at least one of 3 risk factors were present: an eating problem that resulted in the patient not taking enough nourishment, choking on food, and visible weight loss from not eating enough food. The interviews occurred on average 2 years after the nursing home resident's death, so there may be some recall issues. But what the authors did find reaffirmed my belief for the importance of integrating both geriatrics and palliative care. 14% next-of-kin reported that there was no discussion with a healthcare provider before the insertion of that feeding tube (91% of these family members believed that a discussion should have occurred). Even if the next-of-kin reported a discussion prior to feeding tube insertion, nearly half (42%) reported that the conversation lasted less than 15 minutes. Discussion of the risks of feeding tube insertion occurred in only half of the cases. The possibility of hand-feeding was not discussed in nearly one-third of the cases. 38% of the time a physician was “strongly in favor” of inserting a feeding tube. 11% of respondents stated that the physician pressured them to put in a feeding tube. 26% stated that a feeding tube was inserted to make it easier for staff to feed the patient. 26% of the decedents were physically restrained after feeding tube placement. 40% of family members stated that the feeding tube seemed to bother the patient. Nearly a quarter (23%) of family members stated that they regretted the decision to insert the feeding tube. This study highlights the importance of not just talking about the lack of benefits of feeding tubes, but the high risk of adverse events and possible options like careful hand feeding. Patients and family members may have very different ideas on the value of feeding tubes if they hear that nearly 40% of tube fed individuals need to be physically or pharmacologically restrained in order to keep feeding tubes in place. What do you think about 1/3 of family members thinking it improved the patient's QOL? That seems like a lot. While we should share with patients that feeding tubes aren't beneficial (from a purely medical standpoint), some families may find a lot of peace in "feeding." Once again, I think the right course of action is to not deny feeding tubes outright but rather have an open-minded, patient/family-centered disucssion. I think conversations should also go on before the patient has lost decisional capacity that lead to getting informed consent for SPOON FEEDING. Just because a patient can swallow does not mean s/he wants to prolong her dying. I have written extensively about this in a series of books, one of which is called "Peaceful Transitions: Plan Now, Die Later--Ironclad Strategy," which is available from the non-profit organization I lead (Caring Advocate) or Amazon or B&N in print or e-book format. We also have a "Natural Dying--Living Will" that my colleagues and I have worked on for several years and the new tool, My Way Cards, that creates this Living Will. Thank you for highlighting such an important study. 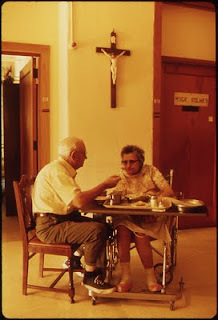 I am currently caring for patients on the Acute Care for the Elderly (ACE) hospital unit with a few patients who are at the stage of dementia where we are having the feeding tube placement discussion, so this reminds me of the importance of taking the time to sit down with families to discuss what their loved one would have wanted and the goals of care for their loved one. Approximately one in ten choosing a feeding tube seems quite low--I wonder if it is much higher in coastal/metropolitan areas where interventions like these tend to be used at higher rates? Also, that over three-fourths of the families did NOT regret their decision raises the issue of who the feeding tube is comforting--especially since restraints, sedation and general discomfort for the patient reportedly increased as the result of the intervention. Very informative statistics, thanks for sharing this. The role of the speech pathologist (often called to evaluate patients with advanced dementia and swallowing problems) cannot be understated in decisions about feeding tubes. Ideally, the speech pathologist can be a great resource in developing a comfort-oriented plan for continued oral eating / feeding, and I would advocate involving the speech pathologist in these discussions proactively so that everyone is on the same page, and so families do not get mixed messages from the speech pathologist and other providers regarding aspiration risk, risk vs. benefits of a feeding tube, etc. Communication is key among providers, and with surrogate decision-makers. For further discussion of the role of the speech pathologists in these scenarios, I will take the liberty of referring readers to our study, "Tube Feeding in Patients with Advanced Dementia: Knowledge and Practice of Speech-Language Pathologists"
- results currently in press at the Journal of Pain and Symptom Management (available online).